Easily and safely install a LCD Flat Panel on any wall or vertical surface with the heavy-duty D 172A LCD monitor wall mount (click here for details). * How to mount a LCD flat screen? 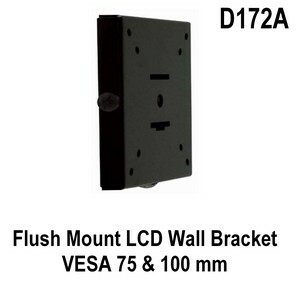 Simply attach one part of this bracket to the wall with the provided hardware and the VESA hole-pattern part to the rear of your monitor, matching your hole pattern ( 75x75 or 100x100 mm). Then hang your flat panel to the wall piece by matching the 2 parts of the wall bracket and secure them with the 3 included bolts. Please call us with your questions and to find out if this can be used with your monitor.